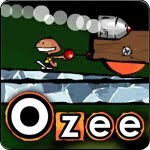 Description: Ozee is a physic based platform game from Limex, where you can interact with the world. Mission of Ozee is to move objects, solve puzzles and collect stars as you make your way to the exit. Much fun!